I see the finish line.... let me lead you to it with this update. Here's what happened to the Adams Farm Road home portrait this week, my fingers have been very busy! The stitching is done! This is my highly advanced weight system to help the piece smoothly adhere to the canvas. In about 24 hours I'll release the portrait from its weight prison, trim the edges and paint the sides of the canvas. Then it'll have its very own photo session and will be presented to the owners. And then I can share the final product with all of you! Now is the time to check out the commission page on my website and email me (natalya at artbynatalya dot com) to book your very own portrait. The home portrait I've been working on is moving along nicely. I have finished putting in all the outlines, and now I am considering how to stitch the details. I am still considering these trees. Do I want to add finer details with hand stitching or scrap the idea and thread sketch them with the sewing machine? I wonder if baby toes will make good bushes?? And then I also got an idea about bushes and baby toes. I think I'll give it a try! More pix next week! February has been a busy month so far and promises to continue to be so. I am simultaneously working on two projects in the studio. They could not be more different from each other. One project is a home portrait for a sweet family with a brand new daughter. 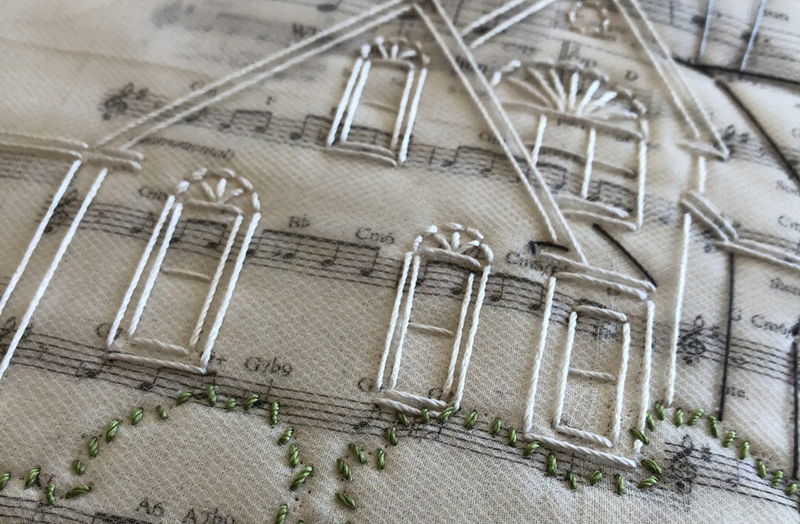 I am loving incorporating her hospital hat, onesie and sheet music of special songs into an image of their home. I am taking time to thoughtfully hand stitch all the pieces in place, making sure all the right details are included. I am furiously stitching on my Bernina sewing machine for my other project: the installation for the Rye Arts Center exhibit in March. I have pieces of plastic bags and various sheeting all stitched together; I am about half way through stitching the outlines of the fire escape on them. After that, I will piece all the sections together. I'll likely spend a few days cutting out the negative spaces between the outlines. I am still figuring out the logistics of hanging the piece in it's outdoor space, between two trees. Making sure to keep my inspiration tank full, I was recently on a photo safari in NYC. And while I was quite busy trying to get good shots of buildings, rusty bridge undercarriages, and sidewalk cracks, I could not help but notice plastic litter in leafless trees. I abhor litter of any kind, but it's especially plastic litter that makes me want to weep. For goodness sakes, if you can't recycle it, is it so hard to put it into a garbage container? To carry it just a few more feet to the trashcan on the corner? Ok, rant over. Here's the interesting thought... as much as I despise seeing plastic trash flapping in the wind on trees, I am also inspired by it. Is that crazy? I don't think so. I think that the installation that I am working on right now is partly inspired by the plastic bags I have seen caught in tree branches along highways. In my case, the plastic that will be waving amongst trees is obviously not trash. It is quite intentional. I can't wait until you see it! Here's a review of what's been happening in my studio this week. Lot's and lot's of stitching! I've been stitching the small pieces that will make up my extra large installation. I made a quick visit to NYC for some inspiration. I tried out one of the stitched plastic pieces on the window to see how translucent it is. Wow! Sometimes that's the only word that can be uttered. My reason for the word in this case, is that I am amazed and grateful that so many people loved to participate in a hands on community art project! I was delighted to organize a collaborative art piece created with reclaimed and repurposed materials at the Armonk Outdoor Art Show. Thank you to the Friends of the Library, who collected materials and provided the space, thank you to the volunteers to helped visitors to the Armonk Outdoor Art Show participate in the project AND thank you to those visitors who took the time to stitch on or glue on a piece of plastic and help our tree grow! We're hoping to schedule a stitching day at the North Castle Public Library in Armonk in the near future, so that interested collaborators can come help me put finishing touches on this artwork. Meanwhile please enjoy the photos from the project and stay tuned for further developments! This is how our tree looked on Saturday morning at the beginning of its journey. By Sunday morning it was well into its transformation! And here it is by the end of the day Sunday! Wow! The following are pictures taken by our talented photographer Ilene Africk, of all the hands which made the art! At the end of this month, I would be delighted to greet you in booth V-08/09 at the Armonk Outdoor Art Show in Armonk, NY. September 29th and 30th, 10AM to 5PM, rain or shine. The exhibit was just ranked as the #2 Fine Art and Design Show in the entire United States by Sunshine Artist Magazine, August 2018. The #2 Rank, based on sales reported by exhibitors to Sunshine Artist, is a spectacular jump from the previous #46 position! This is THE show for sophisticated art lovers expecting to find top quality work available to purchase! I will be bringing brand new series of stitched collages that I am calling City Sketches. And, of course, a collection of your favorite urban subjects - fire escapes, bridges, and graffiti - will also be on hand. In addition to presenting my artwork, I will be directing a collaborative art piece created with reclaimed and repurposed materials, a portion of which will be brought in by community members. 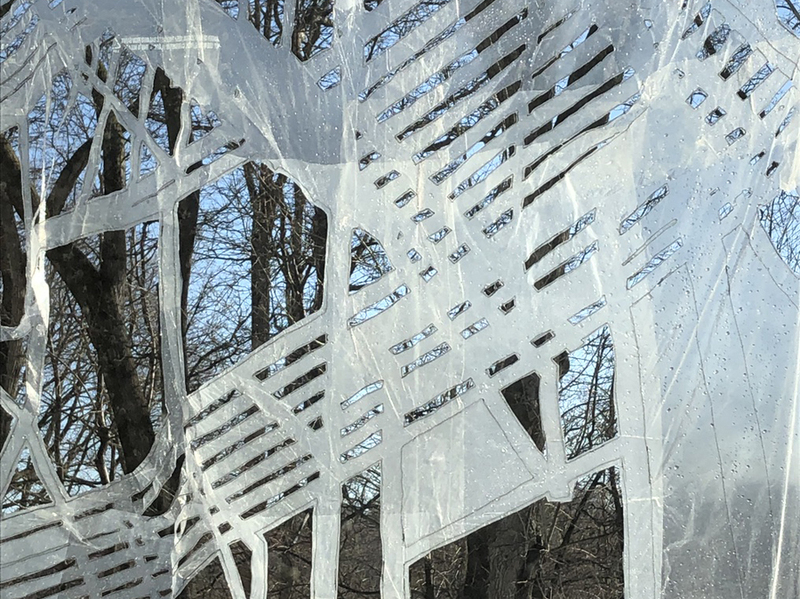 Visitors will apply layers of plastic to the outline of the Armonk Outdoor Art Show tree logo. After the show, I will finish the artwork with my signature stitching and it will be installed at the North Castle Public Library in Armonk. If my solo exhibit had a title, it would be Thoughtfully Repurposed. But it doesn't have an official title, and as it's coming down on Friday, I thought it was time to share a few photos. Those of you who were able to see it, I sincerely appreciate that you came, your kind words mean so much to me! Those of you who are too far to come, I appreciate all your well wishes also. Thank you. I love fire escapes. There. I've said it. Wait. I may have said it before. Well it's true. I do love them. Let me count the ways. I love their graphic lines, their rusty or sleek texture, their negative space, the layers upon layers of straight lines, the angles. I love interpreting them in stitch. Large, small and medium. And extra large of course.